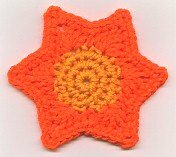 Free Sun for June Crocheted Coaster Pattern from Craft Designs for You! This coasters is part of the Coasters of the Month collection. GAUGE: The first 3 rounds = 2"
With Orange yarn, ch 4 and sl st into first ch to make a ring. Rnd 1: Ch 1, 8 sc in the hole made by your ch ring, join with sl st to first sc. Place a marker in the last (8th) sc - move the marker to the last stitch in each round to help mark your place. Rnd 3: Ch 1, 2 sc in the same st as joining, sc in next st, (2 sc in next st, sc in next st) around, join with sl st to first sc (24 sc) Finish off. Rnd 5: Ch 1, sc in the same st, [sc in next 3 dc, (sc, ch 3, sc) in ch 2 space, sc in next 3 dc, sc in next sc] repeat around, join with sl st to first sc. Finish off. Weave in loose ends with tapestry needle.